Keith Roost, moving step Swimming Dragon. Golden Rooster Institute(Portugal and School (U.K.) All my public teaching is organised here with Gloria. 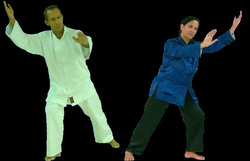 www.hktaichi.com/ Cheng Kamyan. Home of the Hong Kong Tai Chi Chuan Association. Keith and Gloria, Vanguard arms. British Council for Chinese Martial Arts a UK government recognised governing body, allied to IWUF. Tai Chi and Qigong Federation for Europe, exactly what it says.